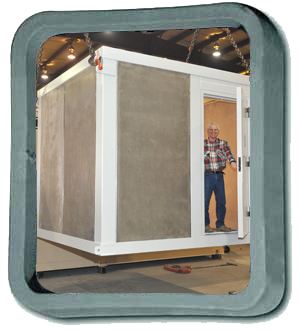 Modular Building Design - Portable Building Construction Prototype | CID Associates, Inc.
Our experience, engineering and planning make the difference. Our experience, engineering, and know-how created this new product - from conceptual idea to mock-up modular building wall system and conventional construction drawings in less than two weeks. Quote from Market Development Manager: "I appreciate your quick response and I think I speak for all of the research and development personnel when I say we were blown away with how quickly you were able to design and fabricate a sample wall system to house our ceramic panel technology." The CID/Proto-type liftable building has outstanding capabilities which include GSA high and low blast requirements, DOD Charge weight I and II, and with advanced design and increased ceramic panel thicknesses, Personal-Born Improvised Explosive Device (PBIED) and Vehicle Born Improvised Explosive Device (VBIED) can be deterred. The incorporated ceramic panel performance can be enhanced with aggregate strike face inclusions. The strike face improves capabilities and defends against NIJ 0108-01, UL 752, Stanag 4569, and EN 1063 various threat levels. Custom thicknesses to defend special threats are available upon request. CID's Proto-type liftable building structures can be fully assembled and operational with electronic equipment installed. CID's Mirawal® interior board finish is a two-fold intrinsically safe spall layer made to capture fragmentation from ballistic or blast occurrences. It also provides interior fire rated capabilities to protect against any flammable emergency. Copyright © 2015 - 2019 CID Associates, Inc.